Bunions are painful, sometimes debilitating, deformities of the feet. They hold you hostage, limiting your ability to go about your daily life without discomfort. These develop when the big toe becomes misaligned. The joint at the base of the big toe bulges outward, often becoming irritated, swollen, and painful. Many factors play into the development of this problem. Once you have a bunion, though, there’s no getting rid of it without treatment. Your feet are made up of bones, ligaments, tendons, muscles, nerves, and blood vessels. When your structure is not strong or is built differently from what is considered “normal,” your bones are more likely to slide out of alignment with pressure. We put pressure on our feet every day—walking, running, even just standing around. Without sufficient support to keep your feet stable, over time, your toes can get pushed out of position and form bunions. Pre-existing conditions that weaken the foot, injuries, and bad shoes may make you more likely to develop a bunion or to exacerbate one that’s already there. Pre-existing conditions could mean many things: bad arches, rheumatoid arthritis, muscle imbalances or nerve damage—anything that puts extra pressure on a weakened or displaced toe joint can influence it to bulge. 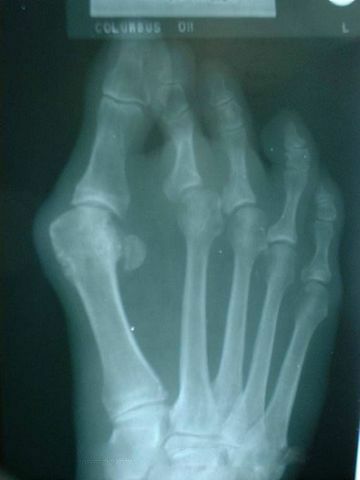 Though more rare, trauma to the foot could shift the big toe and induce swelling. Poorly fitting footwear, especially if it squeezes the toes, can influence a bunion’s formation and make a developing one worse. Shoes also rub against the bulge and irritate it, making it even more painful. As the joint protrudes more and more to the side of the foot, the bones and soft tissue become progressively more inflamed and uncomfortable. If the big toe gets pushed farther to the side and crowds the other toes, other conditions are more likely to develop, such as corns, calluses, and hammertoes. That painful bump on your toe alone can make it difficult to walk, but if additional problems arise, even moving around could be significantly more challenging. Don’t wait until your foot is deformed and constantly painful to seek help for this condition. The experts at Dallas Podiatry Works are able to offer conservative treatments to both deal with and prevent your foot pain from getting out of control. Surgery is the only way to really “fix” a bunion, but many conservative treatments exist to limit its development and reduce pain. Properly fitted and supportive footwear helps relieve the pressure on the toes and holds the foot in proper alignment. Pads reduce pain from the joint rubbing against your shoes. Orthotics can also help stabilize your feet. Foot specialists Dr. Joel Brook and Dr. David Northcutt will evaluate your condition to determine the best kind of treatment to deal with your pain and handle your bunion’s growth. Your feet were not meant to be held hostage by uncomfortable, swollen joints. Bunions are easy to prevent if you are aware of your individual needs for support and foot comfort. Don’t wait until walking inspires agony to seek help for your foot health. Contact Dallas Podiatry Works for more information or to make an appointment to deal with your bunions and other foot concerns. Start by visiting the contact page online, or by calling either conveniently located office: (972) 566-7474 for the Dallas office, or (972) 943-3323 for the Plano office.